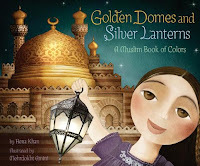 Golden Domes and Silver Lanterns: A Muslim Book of Colors by Hena Khan, illustrated by Mehrdokht Amini. Grades PreK-3. Chronicle Books, June 2012. Unpaged. Review copy provided by my local library. So starts this beautiful Muslim book of colors. With simple, rhyming couplets, Hena Khan takes us through a rainbow of colors, relating each to an item or event in the Muslim faith. The text is sparse and perfect for sharing with older preschoolers or early elementary students. Each couplet introduces new vocabulary (defined in the back of the book), including hijab, mosque, kufi, Ramadan, and more, making this a great choice to start conversations about different cultures. Each spread by illustrator features a different color, of varying saturation. The red spread is rich and warm while the blue spread is paler, a blue reminiscent of a cloudy day. The Muslim family members who take us through each color and concept are depicted with large, almond-shaped eyes, giving them a dreamy look. Muslim people featured throughout the book have varying skin tones and features. Details in the illustrations (such as people in their sock feet while at the mosque putting money in the donation box on Eid) invite further discussion. This is a versatile book that could be used to add diversity to storytimes and units on colors or could be used to start units on religion or cultures. Be prepared to explain the many Muslim words included when sharing this book with young children. It will definitely be welcomed in libraries and schools serving Muslim populations, but this is a wonderful book that should be read by a wide audience. Pair this with Faith by Maya Ajmera, Magda Nakassis, and Cynthia Pon for a discussion on different religions and cultures or with Round is a Mooncake by Roseanne Thong and Grace Lin for a concept storytime featuring different cultures. Golden Domes and Silver Lanterns is on shelves now! Happy Nonfiction Monday! This week's roundup is over at Wrapped in Foil, so make sure you stop by and check that out for more great nonfiction book reviews!